Okay, so this isn't a movie, but whatever. We finally got our hands on the audio recording of The Rivalry , a play that was performed at the LA Theatre Works in 2009. 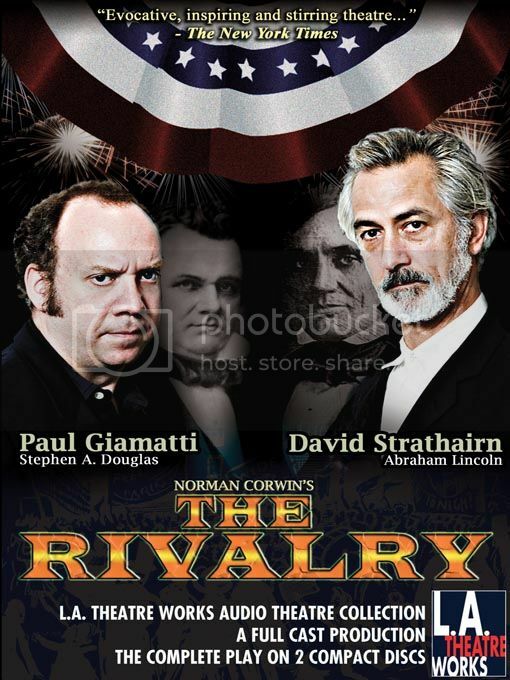 Written by Norman Corwin, The Rivalry examines the legendary marathon debates between incumbent Senator Stephen Douglas and a young(ish) Abraham Lincoln for the Illinois Senate seat in 1858. It stars Paul Giamatti (!) as Douglas and David Strathairn (!!!) as Lincoln. Holy mother of God. So we haven't reviewed it yet, but the HBO miniseries, John Adams, was something of a Big Event here at the PPCC, and it rekindled the flame we have in our hearts for American history. Gosh, we do like our American history. And Civil War stuff is one of our favorite topics. 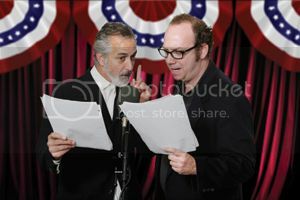 Hence our nerdgasm upon seeing Paul Giamatti, of John Adams fame, and David Strathairn, of glorious John Sayles movies and, of course, Good Night and Good Luck, in a play about that fertile, fascinating period. The play does a great job of capturing the character of Lincoln (we're not as familiar with Douglas - shamefully). Apart from being, well, really tall and vaguely noble, not many know that Lincoln also had quite a high-pitched voice, suffered from recurring bouts of serious depression , and was famous for telling good jokes. This is all (wonderfully) exploited in the play, what with Strathairn's wry, drawling debate style and - typical for Strathairn roles - underlying sense of the dignified yet damaged. Giamatti brings his John Adams-the-firebrand passion to the role of Douglas - indeed, the story is told from his point of view, and it really raises the historical figure of Douglas out of his "racist guy who lost to Lincoln" hole (well, in our heads) to someone much more complex and intriguing. Mostly, we just follow the debates - the main argument between the Democrat Douglas and the Republican Lincoln was over slavery, and whether states had a right to maintain their slavery-enabling status quo, or whether the Federal government was justified in abolishing slavery on a nationwide scale. The debate over this issue was eventually one of the things that split the country in two - something both Douglas and Lincoln are anxious to avoid during these debates, even if both are pessimistic. And the debate itself is passionate, if unnerving - they debate over the relative inferiority of races (and if such a hierarchy exists), over the Declaration of Independence's interpretations ("…that all men are created equal…"), over the rights of the state versus the rights of the nation. Everything is done with great passion, debating cleverness and respect. The arguments are exhilarating and maddening. Now, if they only turned these debates into an anachronistic, ironic, Jon Stewart-flavored punk rock musical, life would be complete.